Comfort food, Mexican-style. 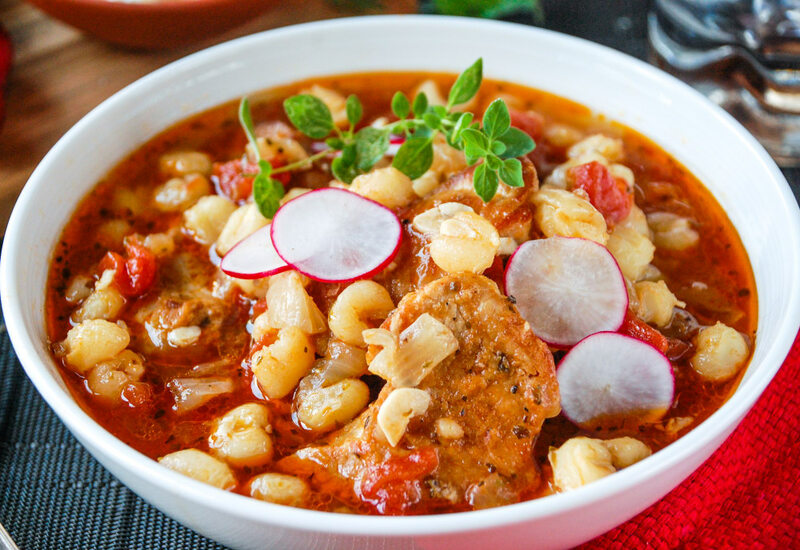 Pork pozole is a traditional soup from Mexico, where pork shoulder is slow simmered with hominy resulting in a flavorful, comforting, and hearty soup. The stew is cooked until the pork is fall-apart tender, and the hominy is full of corn flavor with a wonderful chewy texture. A variety of Mexican aromatics and spices add tons of flavor and warmth. This soup only takes a few minutes to pull together, then let simmer it away on the stove. Serve with sliced radish, queso fresco, and lime wedges for a more authentic experience. Hominy is made from whole corn kernels that have been soaked in a lye or lime solution then rinsed. This process makes the kernels puffy and chewy with a unique and delicious flavor. Canned hominy is typically found in the ethnic section of your supermarket or sometimes with the canned beans. Per Serving: 515 calories; 35g fat; 10.8g carbohydrates; 37g protein; 138mg cholesterol; 742mg sodium. This was my first time trying pork posole and it was really good. I added radishes, queso fresco, and lime wedges and it was very filling and hearty. What I loved most about this dish was the broth, it had a distinct taste that you can only get by using pork. This was a delicious Mexican soup with authentic flavors. The pork shoulder made this dish very hearty as well. Perfect for cool weather days.